Home > Recycling Issues > What's in the Average Home's Waste? 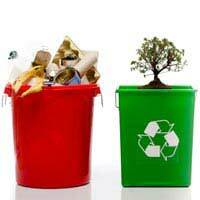 The world of waste management gives rise to some wonderful facts and statistics – it’s just that sort of a field. If every aluminium can in the UK was recycled, for instance, we’d need 14 million fewer dustbins; the average British household uses 500 glass jars and bottles a year; annually, each one of us get’s through nearly 40kg of newspapers. Fascinating though these figures are – and leaving aside the fact that yes, people really do get paid to compile this kind of stuff – there’s a very serious point behind all this talk of “typical” households and the contents of the “average” bin. The real reason people actually do don their overalls and go raking through rubbish to work it all out is that it helps the government, local authorities and waste companies, plan. Without an idea of what makes up the country’s waste – and how much of it there is – trying to ensure that you can have the right facilities in place to deal with it sustainably would be virtually impossible. So, what is in the average home’s waste – and how much of it can be recycled? With 15.1% being officially classified as “other” – possibly because much of it was simply unrecognisable! As you might expect, the picture for the “average” recycling bin tells a slightly different story, though if you look carefully, it’s not too hard to see how they relate to each other. Again, the missing material (7.8% this time) is categorised as “other” but this time, it reflects the different items being fed into various local or one-off recycling initiatives run in particular areas of the country. The percentages are interesting in themselves, but they are perhaps even more enlightening about the kind of facilities that we currently have in the UK and what that tells us about the average British household’s experience of recycling. With co-mingled waste – that’s when the council collect all the dry recyclable material together in a single box – accounting for only around one-eighth of the total, seven-eighths of us are being asked to do a lot more to help separate our waste for ourselves. The good news is, we seem to be doing a pretty fine job. Across the UK, recycling rates have rocketed since the millennium, hurtling from around nine per cent in 2000, to an average of more than 25 per cent today – and that, obviously, has been reflected by a corresponding drop in the amount of waste heading for landfill. Paper, metals and glass recycling have clearly played a big part, but as the previous list shows, right up there at the top of the list is composting, accounting for more than a third of household waste recycling – 2 million tonnes of it being processed in centralised schemes alone. It’s obvious if you think about it, but the nature of waste changes over time. It’s not so long ago that one of the principal components of the average “dustbin” was the ash from coal fires – and plastic was a very small element indeed. Understanding those changes, of course, is an essential part of planning for the future and as more and better methods of recycling are devised, and new uses for recycled products found, that also means deciding what collection schemes and facilities to put in place. It’s a big challenge for planners and policy makers, but as even a quick look at the contents of the average home’s bin makes very clear, get that provision right and you really can alter the way we all treat waste. Now that sort of change is definitely something to be encouraged!